We love this recipe, so simple and so delicious. It's a real old favourite that we do again and again for shoot lunches, at home for dinners for two or as a treat when friends come over. There is something wonderful about the shells piled high and looks quite magnificent yet they are pretty inexpensive in the fish world. We were recently in Italy doing a recce for a Tart yoga retreat we are planning and staying in the most beautiful house in Tuscany where a bootcamp retreat was undergo. The food was delicious and super healthy, all about detoxing and restarting and we picked up some good healthy tips. But on the final night we did a tart take over and had to choose one dish that would be Italian but healthy and celebratory, we really felt quite nervous, the food had been so good that the pressure was really on. In the group there was a bunch of beautiful healthy girls who knew far more about nutrition than we did and a super star football player! After a lot of thinking we decided on this recipe, we added the aioli which I think is a bit of a naughty option when on a retreat like that but they let us keep it. We served it with red rice and the nutty flavour went well, however if making at home we would serve with toasted sourdough for mopping up the juices. After feeling so nervous about it they all had seconds and the best part is the football player asked for the recipe!! Wonder if he has ever made it. Ps although slightly being told off for the amount of wine in the recipe for those on a detox, oops. Mussels and clams can feel a bit intimidating to prep - but it's all quite easy. For the Mussels it's ideal if you can ask the fishmonger to clean and de-beard, but if they are not going to it's actually fine to do at home. 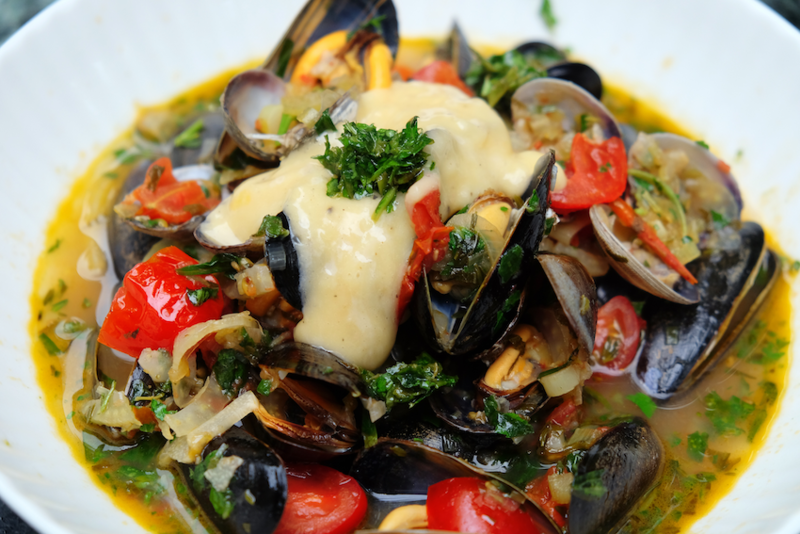 Empty the mussels into the sink and discard any that are cracked or not fully closed. Under running water pull hard the stuff that is hanging out of the shell (the beard) and place In a bowl to the Side - and that's it they are ready for cooking. Clams want to Be put into salted water, but 20 mins before cooking rinse and leave in unsalted water. A quick tip - ocado do good pre cooked frozen clams that once defrosted can be added to the stew and served straight away, this is good for those who are slightly unsure on cooking them. 1. Melt the butter and the olive oil over a medium heat in a large pan. 2. Add The shallots, leeks, fennel, garlic, chilli, thyme, sage and rosemary to the pan and sauté till just starting to caramelise. 3. Add the white wine and the stock and simmer for about 10 mins to let the alcohol burn off. Turn off the heat add the tomatoes and leave to stand for at least 30 mins. 4. In the mean time make the aioli - add the egg yolk, whole mustard, garlic, lemon juice and seasoning to a medium bowl. Very slowly drizzle in the olive oil while whisking by hand or with an electric whisk till it comes together and forms a mayonnaise. 5. Bring the onion and tomato mixture back to the boil and add the clams and mussels. Cook for about 7 - 10 mins until they are cooked - the shells should be open (if you have some that are tightly shut discard as they are not to be eaten!). While cooking stir the pot so they all have a go cooking in the liquid then replace the lid so the top shells can steam. 6. Divide between bowls and sprinkle with the basil and parsley mixture with a generous spoonful of the aioli.